The UK Is On Its Way To Becoming The Joke of Europe. The issue of homosexuality is a subject that has long divided the church, especially, within the Anglican church. Hence, it is not surprising that recent news reports about the ordination of a lesbian Bishop, has once again raised the divisions that keep sinking deep into the spine of the US Episcopal Church and the global Anglican community. With this in mind, how does theatre, then approach the same subject without being sensationalistic and focusing on the rifts in the church, never putting a face on the human beings whose hearts are being wrenched as they wrestle with the reality of their lives. 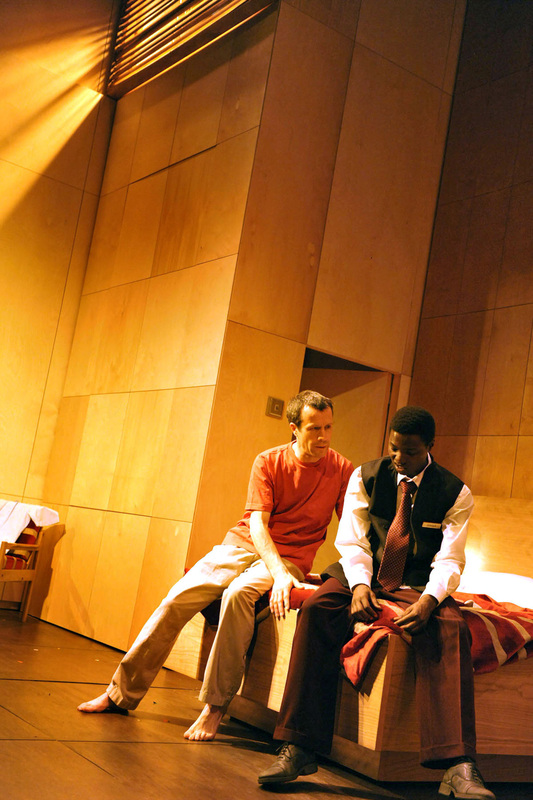 Love The Sinner by Drew Pautz, currently showing at the National Theatre, does not claim to have all the answers but it does its best to show real people struggling as they come to terms with who they are and their faith in God. So, we have Micheal, a married man who volunteers in his church group as they go on a mission in Africa. I would like to say, the mission was not to save Africans but to find a way to save the church. While out there, his encounter with Joseph, a porter at the hotel where the Church primates are residing, leaves him with a life altering experience. And so, truths must be told and realities confronted – the very fact that he is leading a double life, as a man who is married but happily sleeps with another man, and he finds it hard to be with his wife. Hence, the struggle to reconcile his faith and the man he is as one, even as far as reading his bible more than usual and putting picture frames on the walls of his office to suggest a godly presence. Needless to say, this does not go down very well with those who work for him, for obvious reasons; one minute he is himself and the next, they barely know who he is. A confused man is not good for business I guess and of course we are confronted with the reality that you have to find a balance within the space you share with others when expressing your faith. What I found interesting is the fact that this play opens with the primates debating whether or not to give consent to the ordination of gay and lesbian priests within the church. And though, Pautz, does his very best not to make it obvious the particular church he has based his play on, you can tell, where the inspiration for his story stems from. Instantly, we can see the very fact that the African arm of the church will not do as their Western counterparts, who feel the need to compromise. Now, take a good look at the sham marraige of Micheal and his wife, Shelly, who desperately wants to believe she can have it her way though she is fully aware of the truth. Their silly jokes about the family of squirrels up in their chimney, which symbolically represents the family she craves is rather meandering and dull and this is where Pautz could have given us more action between the couple. While Jonathan Cullen and Charlotte Randle, do their utmost best to carry both characters, you sometimes feel as if they have not been given enough to work with and so, you are not getting everything their characters have to offer. Let’s not forget that Micheal went to Africa, as his deeds over the ocean comes calling when Joseph, with whom he had extra-marital liaisons, turns up at his door in London. Joseph also has his own struggles to deal with as he comes from a culture that frowns upon homosexuality. He is brutally beaten and left with scars that leave you thinking about the real life struggles of people who have to live in fear of being outed. But Joseph has other plans up his sleeves where Micheal is concerned. He may not seem bitter but he wants to know where he stands. This is a role Fiston Barek gives his all as he lives and breaths Joseph, an intelligent young man who is angry, wants to belong somewhere and of course, get the man he travelled across the ocean for. With the exception of the clumsiest love scene I have seen on stage in long time, Love The Sinner is a title that speaks for itself. As the church struggles to come to terms with the changing tides of time, can it afford to turn its back on those who need a place of refuge during their personal turmoil as they struggle with who they are and the rejection they face in society or as in the case of Joseph, persecution? Where does it draw the line and who decides these things, man, love or God? A question Pautz does his darnedest best to avoid but shows it is possible to love the sinner through Ian Redford, the head of the church, who makes it a point to ask both men, how the church can help them when Micheal’s double life is revealed. Lest we forget, the church also needs a PR expert to manage any negative press and minimise the damage that could have on the image of the church. A role Scott Handy brings much needed humour to. This entry was posted on Monday, May 17th, 2010 at 1:19 pm	and is filed under Africa, Journalism, Theatre Reviews. You can follow any responses to this entry through the RSS 2.0 feed. You can leave a response, or trackback from your own site.